Patrick Zetik (2020) is interested in pursuing a career in Biomedical Engineering. He has spent his Minimester at Hanger Clinic Prosthetics & Orthotics under the supervision of Ms. Sarah Matthews. Hanger has been providing bracing support care for over 150 years. 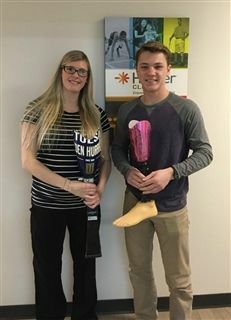 Patrick has observed computer applications, orthotic and prosthetic evaluations/adjustments and consultations regarding recommendations for fit and function of prostheses.